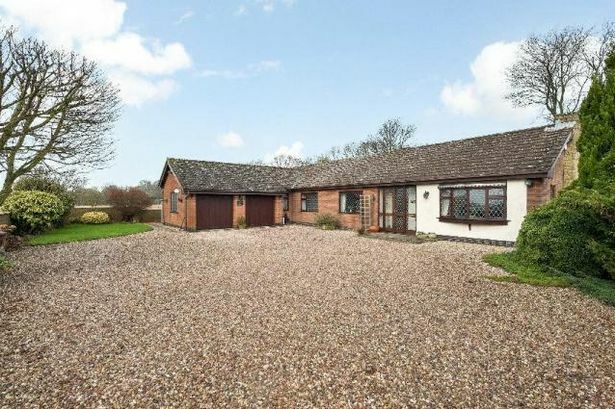 That longed for feeling of being away from it all, yet within easy reach of the main facilities, can be fulfilled at a delightful four-bedroom detached bungalow which is available in Shilton. Stonehaven in Church Road is positioned in a secluded spot at the end of a private drive. It is an immaculate property with stunning views over fields, but close to local amenities and a short drive from a retail park which includes Tesco and ASDA superstores, a number of restaurants and entertainment venues. The accommodation is entered via a storm porch into the main entrance hall, which is a good size with a storage cupboard. To the right there is a large living room with a feature gas fireplace, a bay window and access to the conservatory overlooking fields and leading to the rear garden. Also off the entrance hall is the fully fitted kitchen and the utility room. Further down the hallway, there is an open-plan dining area, family bathroom, master bedroom with en-suite and three more double bedrooms. Bedroom two has French doors onto the rear garden. From the house there is also access to the double garage. Outside is a private garden, again with open aspects across farm fields. The garden itself is mainly lawned. There is also a patio which is perfect for barbecues. The village of Shilton is situated to the north-east of Coventry city centre and provides quick and easy access to the Midland motorway network, including the M69, M6 and M1. Offers over £500,000 are sought by the Fine & Country estate agency which can be contacted on 024 7650 0015 to make viewing arrangements.